Allow us to introduce to you a rare and unique gin and the first of it’s kind in Australia by local distilling outfit Giniversity Gin. The Margaret River distilling Co. 's gin university - Giniversity has really done something extraordinary here after they’ve used a whole host of true Australian botanicals sourced from the surrounding local environment and spent months of long hours distilling and tasting (where do we sign up?) before they landed on an incredibly balanced, handcrafted gin to play with. 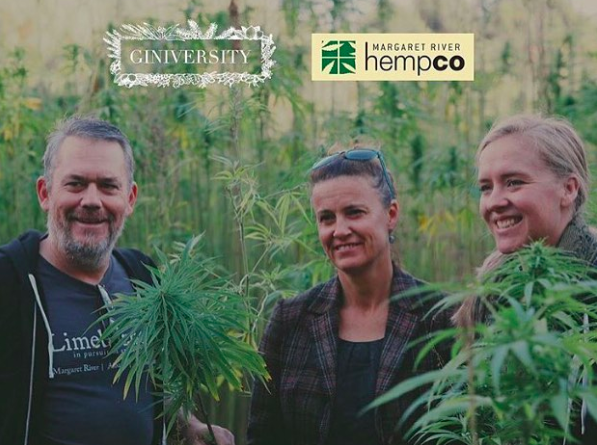 Teaming up with the distillery’s neighbour Georgie and her crew from Margaret River Hemp Co. these local producers were able to impart their 22 years of experience and wisdom from being the largest hemp house in Australia into the distilling process. Hemp hearts (seeds) were then smoked in a very hush hush and secretive smoking session (no, not that kind) with the smoke infusing into the gin over a long period of time. The result is a complex and original 420 friendly gin where you pick up lazy notes of juniper, toasted sesame, sweet orange, a more nutty flavour from the hemp and tons of dank smoke which they’re now super excited to share with the world! Giniversity is a program for learning the art of distilling run by The Margaret River Distilling co. - the sister distillery of Limeburners who have both developed award-winning reputations locally and internationally in recent years for utilising locally foraged, indigenous botanicals for use in their distilling, and producing banging gins. They offer distilling courses to the local public from their home base near Margaret River to teach the art to interested patrons who are able to receive a qualification from the distillery at the end of their course. Check out Giniversity's distilling course. We’re extremely excited to be able to offer you this trailblazing new gin just in time to enjoy it, this Saturday for World Gin Day. Stop by today to grab your very own bottle of this first ever craft gin batch by Giniversity.